Oskar was one of the founders of C’est Bon Kultur, back in the day. He’s been quiet for a while now, but has started producing art again, which is really nice. Especially since he does things like this one. 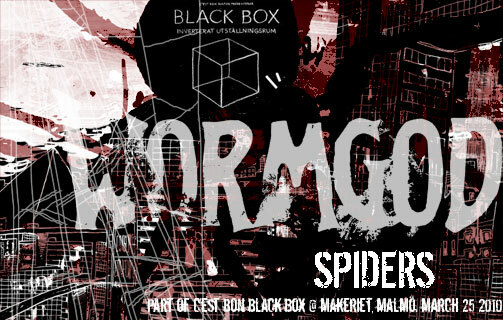 To celebrate the release of Piracy is Liberation 008: Spiders pt 2 and as part of C’est Bon Kultur‘s interactive exhibition Black Box, Wormgod will create a live cyberpunk/cosmic horror experience called Spiders. 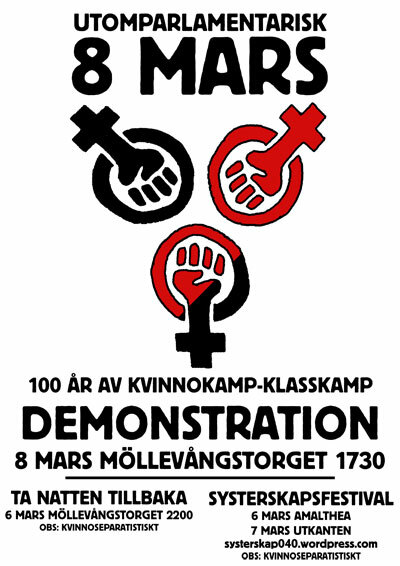 Thursday, March 25 at Makeriet, Malmö. 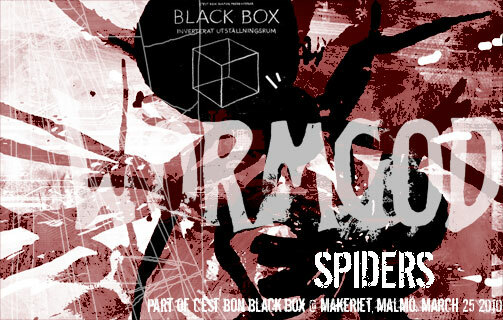 Part 4 of C’est Bon Black Box. I made one for her, for the first Sayonara September book. The second one, which I really look forward to, will be published this fall (in September). Oh, what the hell. I’ll just publish the whole thing here (high-lighting the important stuff)… Still worth the trip to his blog. Frequently updated and lots of interesting comics-related stuff. Then there’s Elftorp’s penchant for mixing in several different influences into his genre crossing comics. He himself describes them on the project’s website as: “Political theory, filtered through autobiography, masked as fiction in the form of cyberpunk postapocalypse…” Well, for the postapocalyptic part, The Matrix is a quite obvious influence, with a lot of cyberpunk thrown in for good measure. Then there’s the political part, where already the title indicates the anarchistic tendencies. And the autobiographical parts… Well, the main character is quite obviously based on the artist himself, at least visually. And that the political part of these stories are a real and genuine part of Elftorp can be seen by the fact that he himself has uploaded the first volumes of the series as torrents on The Pirate Bay. Anyway, I have read most of these comics in various stages, but never all in one go, which I just did. An interesting experience. The art is expressive, sometimes to the point of being unintelligible. Elftorp has an uncompromising attitude towards his art, where the initial feeling of a drawing is more important than making a certain character look exactly the same, panel after panel. 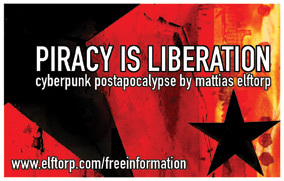 When reading Piracy is Liberation I can never really decide whether this is good or bad, or both. After a while I get really into it though and as with other good auteur comics, the story and the art meshes together to a unity where one could not exist without the other. The story line is a bit complicated, but never for the sake of being complicated. Sometimes it is very straightforward action, sometimes it messes with the mind of the reader and jumps backwards and forwards in time, playing with the whole cyberpunk theme of being able to upload your consciousness to the net. 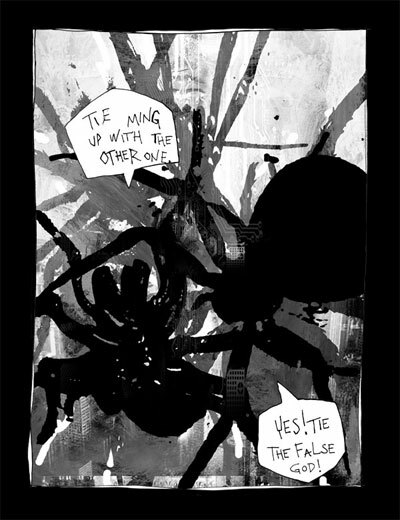 As a voracious comics reader I of course like the part in volume four, where Elftorp plays with the form of comics and mixes metahumor with cyberpunk and lets the characters actually travel across the comics pages, aware of being part of a comics and able to walk backwards and forwards in time – echoing the creation process of the comic in itself. Very shortly put, the story in Piracy is Liberation takes place in a post-apocalyptic world which resembles ours in many ways, but where the whole world is made up of a city where the population is kept in a state of subdued subordination through indoctrination mainly via TV (and yes, V for Vendetta does spring to mind, as does Alan Moore’s own inspiration, 1984 by George Orwell, of course). Fighting against the corrupt corporate system is a small group of pirates using the internet to access iformation, attacking the authority, orgnanising rebellion. It’s all on one level a political metafor for the lives we live today, but never to the point of killing the story, which is engaging, sometimes fast paced and often very clever, with the main characters having to copy themselves into reality due to being locked up in a virtual prison, and the ramifications this entails when there are several version of them walking around. Here Elftorp actually does several things I haven’t read or seen before, which is inpressive as the whole post-apocalyptic/cyberpunk genre has been flogged to death many times over, as far as I’m concerned. But it’s the genuine feeling of the political convictions pulsating thorugh Piracy is Liberation that keeps my interest going and that is what will make me keep reading in the future. Knowing that Elftorp has this series planned to at least 20 volumes I’d be surprised if there isn’t a film made somewhere along the way. I just hope the whole idea of Piracy is Liberation won’t be lost in a Hollywood production (which in itself is the negation of the message of the story). Anyway, until then, do read this strange combination of action and political philosophy and make up your own mind. That’s the main message Elftorp is trying to convey. 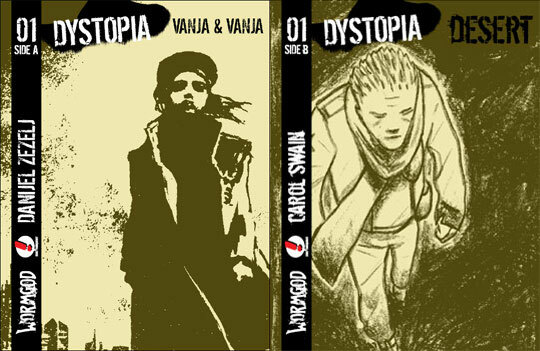 Since December 0f 2009 I’ve been the editor of a series of books called Dystopia (Swedish edistions are called Dystopi). In this series, I’m gathering a wide selection of artists who have created stories centered on dark visions of the future (or in some cases the present). There’s more information at the Wormgod site. 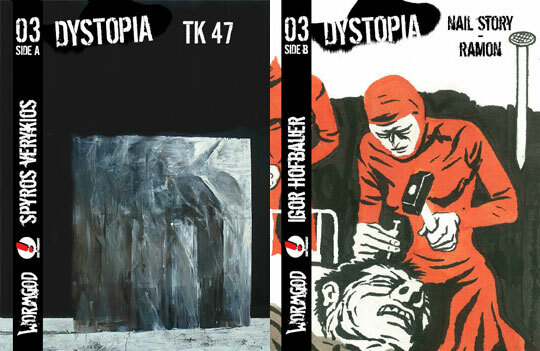 The Dystopia books are published as a cooperation between Wormgod and Seriefrämjandet. Coming soon in English and Swedish. While on drugs, Information has learned how to fly. Still under the influence, she arrives at the Reclaim the Streets party… You might have seen this story before, in Piracy is Liberation 005: Free Section, but for this special occasion, it’s been colored. 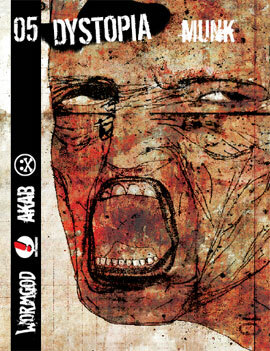 First time ever that a Piracy is Liberation story gets the color treatment, and I’m quite happy with it. Available in English, coming soon in Swedish. Spyros Verykios’ story is set in one of the possible ways human civilisation could end. If Kafka was making a classic zombie short story with painted art, you’d think it might turn out like this. The B side offers two stories set in a surreal future. One is a classic story about jealousy, monuments and nails in the head. The other one is even more surreal. And it contains monkeys. 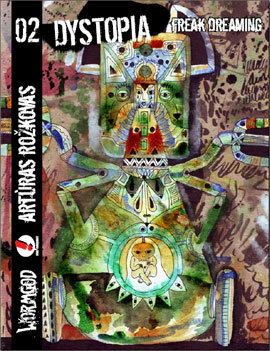 A dreamlike story consisting of a selection of psychedelic drawings that combine to tell the story of a stillborn wolf child. Or perhaps a society whose population has been asleep for too long. Is it just a dream, or something more? I got these more or less randomly selected pictures and put them together and they turned out to tell a story that I hadn’t really expected when I started doing the selection. Very good start for the series, setting just the mood I was looking for. 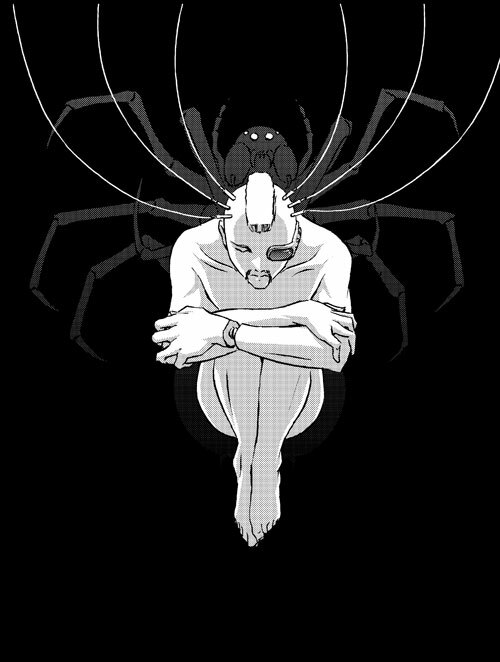 Both stories have been published before in C’est Bon Anthology, a few years back, but I still wanted to use them for this, since I felt they would be perfect for a Dystopia split issue. This is also the first time any of the two artists have been translated into Swedish (which, so far, is true of all the contributors to Dystopia). Vanja meets Vanja after practice to share a fruit. Vanja likes Vanja’s medal, but he has to run because he isn’t allowed to be off on his own for too long so they’ll meet again the next day. This story was adapted into a short film: Racconto di guerra. And Carol Swain tells the story of a group of soldiers making their way across a desert landscape. Here’s a logo I put up on www.elftorp.com today. I made it for an old friend. Anachora is Swahili and means “she writes”. Which she does. Ok, ok. Long time no blogging. I’ll try to make it up in the days to come. 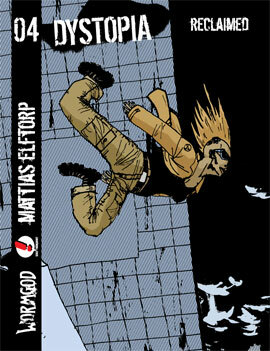 Today, I’ve made the translation of Dystopia04: Reclaimed into Swedish. Everything except the title, which I will have to figure out during the evening. Something that retains the double meaning of the English one, if possible. But the best I’ve come up with so far is “Dagen då vi spöade snuten“. I’m not sure if that’s good enough. Dystopia04: Reclaimed. Cover (and contents) by Mattias Elftorp.